God works in spite of evildoers, not through them. Deception of self and others gives way to truth at Day’s End (7:21–23). Jesus advises us to build our hope for salvation on the right foundation—Him (7:24–29). Jeff reviews the entire “Sermon on the Mount,” and offers closing reflections. 01:04 PLEASED TO WELCOME YOU AGAIN TO ZOLA LEVITT PRESENTS. 01:08 AND WHAT ARE WE PRESENTING? 01:10 A STORY ON JESUS. 01:12 IT'S A GREAT STORY! 01:14 THOUGH WE DON'T BEGIN WITH GREATNESS. 01:17 NOW WE BEGIN WITH WEAKNESS. 01:24 ON THE HUMAN CAPACITY FOR SELF DECEIT. 01:28 FASTEN YOUR SEATBELTS AND GO WITH ME ON THE JOURNEY NOW. 01:55 A MAN STANDS ON A PATHWAY READING SCRIPTURE FROM A SCROLL. 01:59 CERTAINLY HE WILL BE NOTICED BY THOSE WALKING BY. 02:03 CERTAINLY HE WILL BE NOTICED BY THE LORD. 02:08 "I HAVE PROPHESIED IN YOUR NAME,"
02:11 "CAST OUT DEMONS IN YOUR NAME,"
02:14 "AND I HAVE DONE MANY WONDERS IN YOUR NAME." 02:23 AND HE CONTINUES ON HIS JOURNEY. 02:30 THE CAPACITY FOR SELF DECEIT HAS ALWAYS AMAZED ME. 02:34 I KNOW THAT WE CAN DO A GOOD JOB OF FOOLING OTHER PEOPLE. 02:37 IT AMAZES ME HOW WE CAN DO A BETTER JOB OF FOOLING OURSELVES. 02:52 I WANT TO SERVE NOTICE TO THE FACT THAT HE ISN'T. 02:58 THE LORD GAVE WHAT'S CALLED "THE SERMON ON THE MOUNT"
03:05 "LISTEN...I AM NOT OVER IMPRESSED BY SELF-RIGHTEOUS RELIGIOUS PEOPLE." 03:18 I'M SUPPOSED TO BE JUST TALKING ABOUT WHAT HE'S TALKING ABOUT. 03:25 "NOT EVERYONE WHO SAYS TO ME 'LORD, LORD' WILL ENTER THE KINGDOM." 03:29 THERE'S A LOT OF PEOPLE THAT DO THE PROVERBIAL "TALKING THE TALK"
03:33 BUT THE PROBLEM IS THAT THEY DON'T "WALK THE WALK". 03:39 "YOU DO A GOOD JOB OF PROPHESYING AND CASTING OUT DEMONS,"
03:44 "THERE'S A LOT OF CHARISMA THERE"
03:47 "BUT THE PROBLEM IS THERE'S NOT A LOT OF CHARACTER." 03:57 IT'S REALLY NOT JUST ABOUT CREEDS, IT'S ABOUT DEEDS. 04:18 ISN'T BECAUSE "I'M JUST IN A BAD MOOD BY GOLLY"
04:20 OR "I CAN'T THINK OF ANYTHING ELSE TO SAY"
04:22 "SO I'LL JUST KIND OF GET HEAVY WITH YA." 04:25 WHEN YOU LOOK AT WHAT'S CALLED "THE SERMON ON THE MOUNT"
04:28 THE LORD TALKS A LOT ABOUT DEED. 05:11 IT'S NOT JUST ABOUT PRANCING AROUND LOOKING ALL RELIGIOUS AND EVERYTHING IN CHURCH. 05:22 AND I'M THRILLED PERSONALLY IF YOU OPT TO SPEND ONE OF THEM IN A CHURCH BUILDING. 05:28 BUT THERE'S 167 OTHER HOURS. 05:36 I'M NOT COMING TO YOU FROM A CHURCH BUILDING PER SE. 05:39 OVER HERE BY THE WAY IT'S LIKE ONE BIG CHURCH. 05:41 YOU NEED TO COME WITH ME TO ISRAEL. 05:42 THE WHOLE ATMOSPHERE HERE IS INSPIRING TO BE SURE. 05:55 BUT IT'S WORKED OUT IN LIVING EXPERIENCE. 06:08 AND BE SALT AND LIGHT IN THE WORLD. 06:15 "WELL DONE GOOD AND FAITHFUL SERVANT". 06:40 HE LIKENS THOSE WHO APPLY HIS PRECEPTS TO A WISE MAN WHO BUILDS HIS HOUSE ON THE ROCK. 06:48 A STRONG, STURDY HOUSE IS THE RESULT OF DILIGENT WORK AND CAREFUL ATTENTION TO DETAIL. 06:55 A SOLID FOUNDATION IS PARAMOUNT. 06:57 ONCE COMPLETED SUCH A HOUSE WILL WITHSTAND ALL MANNER OF STORMS. 07:11 AND THE HOUSE STOOD STRONG. 07:18 AND GREAT WAS ITS FALL. 07:42 IS GOING TO HAVE SOMETHING TO DO WITH THE DECISIONS THAT WE MAKE IN LIFE NOW. 07:56 SUCCESS IN LIFE IS PREDICATED UPON MAKING THE RIGHT KIND OF DECISIONS. 08:02 I MENTION THAT BECAUSE JESUS SAID "THAT HE WHO HEARS THESE WORDS OF MINE AND DOES THEM"
08:07 "WILL BE LIKE SOMEONE WHO BUILT ON A GOOD FOUNDATION"
08:14 AND THERE'S PRECARIOUS RAINS AND WINDS THAT BLOW. 08:29 AND THINK OF THE TERM "REST ASSURED". 08:38 AND THEY WILL OUTLIVE THE CHALLENGES THAT COME IN LIFE. 09:11 THEY LACKED THE SUBSTANCE TO WEATHER THE TRIALS. 09:17 YOU EVER HEARD THE EXPRESSION "WEATHERING THE TRIALS"? 09:19 WELL LISTEN TO THE LORD'S WORD. 09:29 AND HENCE THE EXPRESSION "TO WEATHER THE STORMS"
09:34 JESUS SAYS ARE THRUST AGAINST INDIVIDUALS IN THEIR HOMES. 09:42 IS PREDICATED UPON "HEARING HIS WORDS". 09:46 "DEVAR" IN HEBREW, "THE WORD"
09:55 THIS, ACCORDING TO THE LORD, IS A RECIPE FOR SUCCESS IN LIFE. 10:12 MY MIND CAN BE SO CLUTTERED WITH MY OWN ANXIETIES AND TENSIONS AND BAGGAGE. 10:28 PLEASE BE GRACIOUS AND LET PEOPLE HEAR YOU THROUGH ME. 10:34 WE NEED TO HEAR THE WORDS OF JESUS AND DO THEM. 10:42 TO ACTUALLY PICK UP THE BIBLE AND HEAR HIM OUT. 11:03 THAT WE ALL HOPE FOR BUT THAT NOT EVERYBODY ACHIEVES. 11:31 ASK FOR OUR FREE MONTHLY NEWS LETTER "THE LEVITT LETTER". 11:35 WHEN YOU CALL BE SURE TO ASK FOR OUR FREE CATALOGUE WITH THE LATEST VIDEOS, BOOKS, AND MUSIC. 11:44 READING PACKETS, TEACHINGS CDs, AND MAIL-IN TESTS. 11:51 OR CRUISE THE MEDITERRANEAN VISITING GREECE AND EPHESUS. 11:55 PLEASE CONTACT US FOR MORE INFORMATION. 12:37 AND GET SOME STRATEGIES TO MEET THE CHALLENGES OF THE DAYS. 12:43 LIKE A TRIP TO ISRAEL TO FACILITATE THAT AND MORE. 12:55 AND THEY ALL REPORT SOMETHING SPECIAL WHEN THEY GO TO JESUS' LAND. 13:01 HOW ABOUT YOU COMING WITH ME? 13:15 THAT WILL CHANGE YOUR LIFE. 13:18 JESUS OF COURSE IS THE REAL CHANGE AGENT. 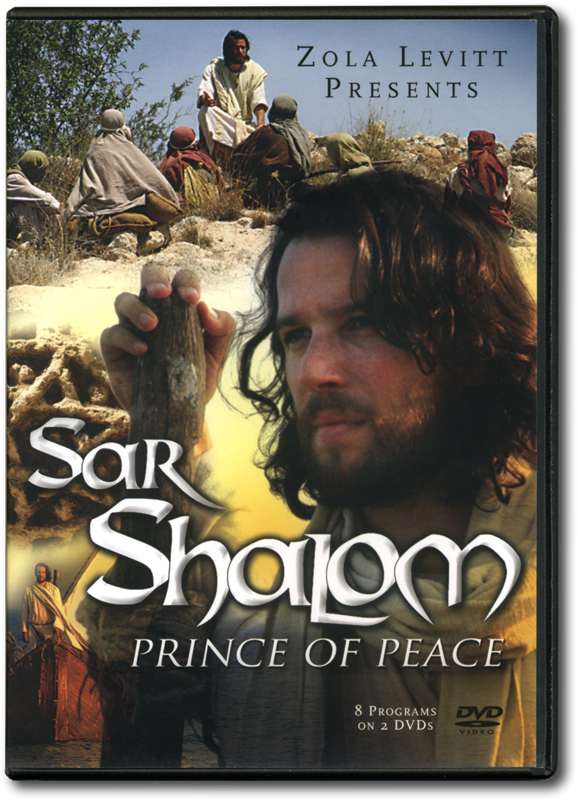 13:25 IT'S THE OFFER ON THIS PROGRAM, "SAR SHALOM - PRINCE OF PEACE". 13:37 LOOKING AT JESUS FROM A JEWISH PERSPECTIVE. 13:57 OFF WE GO NOW TO LEARN MORE ABOUT JESUS. 14:07 AND HE TAUGHT THEM AS ONE HAVING AUTHORITY. 14:12 "BLESSED ARE THE MEEK FOR THEY SHALL INHERIT THE EARTH"
14:17 "YOU ARE THE LIGHT OF THE WORLD"
14:21 "WHOEVER COMPELS YOU TO GO A MILE, GO WITH HIM TWO"
14:28 "DO NOT LAY UP FOR YOURSELVES TREASURES ON EARTH"
14:34 "JUDGE NOT THAT YOU BE NOT JUDGED"
14:38 "KNOCK AND IT WILL BE OPENED TO YOU"
14:43 "YOU WILL KNOW THEM BY THEIR FRUITS"
14:46 "THEREFORE, DO NOT WORRY ABOUT TOMORROW SAYING,"
14:56 "FOR YOUR HEAVENLY FATHER KNOWS THAT YOU NEED ALL THESE THINGS"
15:01 "BUT SEEK FIRST THE KINGDOM OF GOD AND HIS RIGHTEOUSNESS"
15:06 "AND ALL OF THESE THINGS SHALL BE ADDED TO YOU." 15:37 TO GIVE THE ESSENCE AND THE SUBSTANCE OF WHAT IT MEANS TO BE CHRISTIANS, HE SPELLED IT OUT. 16:03 AS THEY MAKE THEIR JOURNEY FROM THE WOMB TO THE TOMB. 16:19 ON THAT SERMON ON THE MOUNT. 16:58 AND CONSIDERED THE FAMOUS SERMON ON THE MOUNT. 17:03 ONE OF WHICH IS THAT THE GOD QUEST PAYS. 17:22 THE ABUSED GET THEIR JUST DESERVE. 17:30 WE'LL FIND HIM IF WE SEEK HIM WITH ALL OF OUR HEART. 17:39 THAT HE'S GOING TO TAKE CARE OF US FINANCIALLY. 17:46 BUT YOU KNOW IT'S ALWAYS BEEN EASY TO WORRY. 17:49 THAT'S WHY JESUS SAID, "DON'T WORRY". 18:01 AND EVERYTHING ELSE WILL BE ADDED UNTO US. 18:05 AND FROM THAT I UNDERSTAND HIM TO SAY THAT HE'S GOT OUR BACK. 18:12 "DON'T HAVE AN EVIL EYE AND BE DISCONCERNED FOR THE PEOPLE AROUND,"
18:17 "TO BE UNCONCERNED FOR THOSE ROUND ABOUT." 18:20 HE SAID "LAY UP TREASURES IN HEAVEN". 18:30 BE A TZADDIK, BE A RIGHTEOUS PERSON AND THAT ENTAILS CHARITY. 18:45 THE LORD SAYS THAT THE HEAVENLY FATHER WHO SEES IN SECRET WILL REWARD US. 18:51 THAT APPLIES TO PRAYER. 18:53 IT APPLIES TO OTHER THINGS AS WELL. 19:09 TO FOLLOW IN THE FOOTSTEPS OF JESUS, ISRAEL'S MESSIAH. 19:17 HE IS THE SAVIOR OF THE WORLD. 19:30 AND TO BE AT THE PLACE WHERE JESUS TAUGHT ABOUT HOW TO HAVE LIFE AND HAVE IT ABUNDANTLY. 19:42 TED SINGS ABOUT ALL THAT AND MORE. 22:08 WELL INSPIRATIONAL MUSIC HAS A WAY OF LIFTING US HIGHER AND HIGHER AND HIGHER. 22:17 THAT ARE PRESSING US DOWN LOWER AND LOWER AND LOWER. 22:23 YOU MAY WELL FEEL IT. 22:40 AND THERE HE WOULD TRANSFORM THEM IN THE PROCESS. 22:53 AT THE VERY PLACE OF THE SERMON ON THE MOUNT. 22:55 I KNOW YOU'RE GOING TO LOVE IT AND BE BLESSED BY IT. 23:02 I'M WALKING UP MOUNT BEATITUDES OR THE SERMON ON THE MOUNT SITE. 23:16 THAT COMES ALONG THE RIDGE. 23:21 THEY PAUSE TO HEAR A PUBLIC ADDRESS BY THE WONDERFUL CARPENTER OF GALILEE. 23:30 THE PEOPLE PASSING BY ARE FORTUNATE ENOUGH TO HEAR THE SERMON ON THE MOUNT. 23:35 THE MOUNTAIN ITSELF IS NOT A LARGE ONE. 23:48 WHERE RATHER ORDINARY PEOPLE WOULD BE PASSING BY. 23:56 OR NORTH OF GALILEE AND HAD TO PASS THIS WAY AS THEY WENT. 24:13 HIS KINGDOM WAS FOR THE MEEK. 24:25 THOSE WHO COULD EASILY PRAY "FORGIVE US OUR DEBTS". 24:39 WHICH THE LORD PRESCRIBED. 24:48 IN HIS OWN DAY AND TIME. 25:05 OF WHAT JESUS IS SAYING ON THE SERMON ON THE MOUNT. 25:11 MORE SO, IT'S A WAY TO BE. 25:22 AND EXPLORE WHAT IT REALLY MEANS TO WALK IN THE NEW "HALAKAH". 25:27 "HALAK" IS THE HEBREW VERB "TO WALK". 25:30 AND WHAT DOES IT MEAN TO FOLLOW THE LORD STEP BY STEP? 25:41 SOMETIMES WE GET VERY RIGID AND FORCEFUL. 25:43 I KNOW I HAVE THAT PROBLEM. 25:53 AND OTHER KINDS OF PERSONALITIES IN CLOSE PROXIMITY. 26:07 THAT CAN LEAD YOU ASTRAY. 26:14 BY VIRTUE OF OUR EXPLORING WHAT JESUS SAID ABOUT THAT PATH. 26:32 AND THEN REACHING UP TO THE KING OF KINGS. 26:35 YOU WILL FIND THAT HE WILL. 26:40 IF YOU SEEK HIM WITH ALL YOUR HEART. 26:42 GLAD TO PLAY A PART IN ALL OF THAT. 26:44 THANKS FOR GOING WITH US ON THE JOURNEY.